Map of Sultanate of Malacca. The Sultanate of Malacca was founded by Parameswara (1344-1414), a Palembang prince of Hindu descent from Srivijaya, in 1402. Fleeing north from the Majapahit armies, he reached a fishing village at the mouth of the Bertam River (former name of the Malacca River) where he witnessed a mouse deer outwitting a dog while resting under a Malacca tree. He took what he saw as a good omen and decided to establish a kingdom there, called Melaka. He married the princess of Pasai in 1409, and accompanied the Admiral Zheng He on several visits to Ming China. These alliances helped to build Malacca into a major international trading port and an intermediary in the lucrative spice trade. Centered in the modern town of Malacca, the sultanate stretched from southern Thailand in the north to Sumatra in the southwest. Malacca flourished under eight sultans, with a well-defined administrative hierarchy governing according to several sets of laws. The sultanate was never self-sufficient, but relied on Asian suppliers. Its only indigenous product was tin. The Portuguese heard of Malacca’s wealth, and, unable to negotiate a friendly trading alliance, invaded its capital in 1511, forcing the sultan to flee. In 1528, the Sultanate of Johor was established by a Malaccan prince to succeed Malacca. The Portuguese invasion disrupted Asian trade patterns and resulted in the decline of Malacca as a port. Parameswara (1344-1414), a Palembang prince of Hindu descent from Srivijaya, founded Malacca around 1400. Sejarah Melayu (Malaya Chronicles) mentioned that he claimed to be descended from the Macedonian King Alexander the Great/Iskandar Zulkarnain. Raden Wijaya, the first king (1293-1309) of Majapahit, was married to Sri Gayatri Rajapatni, a daughter of Sri Kertanegara, the last king (1268-1292) of Singhasari Kingdom, and had a daughter, Tribuana Tunggadewi, the third ruler (1326-1350) of Majapahit. She married Kertawardana, and had a daughter: Iswari, who married Singawardana, and had a daughter, Sarawardani. Sarawardani. married Ranamenggala, and had a son, Parameswara who was born in 1344, during the reign of his great grandmother, Tribuana Tunggadewi, the third monarch of Majapahit. At that time, Srivijaya was losing its influence and faced threats from various corners of the Malay Archipelago. Around the same time, the Majapahit empire, centered in Java, was expanding its borders beyond the island. The Srivijaya empire that previously controlled Java had been driven out of the island in 1290, by Singhasari, a predecessor to Majapahit. As a result, Srivijaya had to move its court from Palembang, on the bank of Musi River in southern Sumatra, to Malayu (now Jambi province) on the Batang Hari River. Although the royal court had moved to Malayu, Palembang remained an important imperial city. In the 1390s, Majapahit sent thousands of ships to attack Palembang, and conquered the city, ending a thousand-year-old empire. Parameswara, who had been living in Palembang as a prince, fled from his palace and eventually reached Temasik island, which was headed by a Srivijayan descendant, Temagi, a Malay chief from Patani who had been appointed by the King of Siam as Regent of Temasek. However, Temasik had been a vassal of Majapahit since 1365. After several days, Parameswara was betrayed by his relative and had to kill him. Parameswara then ruled Temasik for about four years, until he was attacked by Majapahit armies, when one of Parameswara’s ministers opened the gates to allow Majapahit armies to attack the palace. Parameswara fled north to Muar. At Muar, Parameswara contemplated establishing his kingdom at either Biawak Busuk or at Kota Buruk. Finding that the Muar location was not suitable, he continued his journey northwards. Along the way, he reportedly visited Sening Ujong (former name of present day Sungai Ujong) before reaching a fishing village at the mouth of the Bertam River (former name of the Malacca River). This evolved over time to become the location of modern day Malacca Town. According to the Malay Annals, it was here that he witnessed a mouse deer outwitting a dog while resting under a Malacca tree. He took what he saw as a good omen and decided to establish a kingdom called Melaka in 1400. Today, the mouse deer is part of modern Malacca's coat of arms. In 1409, Parameswara married Malik ul Salih, a princess of Pasai, adopted the Persian title Shah, and styled himself as "Sultan Iskandar Shah," although he remained a Hindu to his death. Although he did not convert to Islam, his marriage to the Muslim princess encouraged a number of his subjects to embrace Islam. Part of original copy of Ming Dynasty history (1368-1644) - chapter 325. Parameswara visits emperor Yongle. In the early 1400s, Parameswara embarked on several voyages to China, to visit Emperor Yongle (Chinese: 永樂) (Wade-Giles: Yung-Lo), escorted by Zheng He, Yin Qing (Wade-Giles: Names are Cheng Ho and Ying Ching), and other envoys. Malacca's diplomatic relationships with Ming granted protection to Malacca against attacks from Siam and Majapahit. This encouraged the development of Malacca into a major entity on the trade route between China and India, Middle East, Africa, and Europe. Envoy Yin Qing was sent to Malacca in 1405 to grant golden silk plait and golden lace veil. Yin Qing reported that no kingdom had been established and there was no king, while an annual tax 40 golds was paid to Siam. Chieftain Pai-li-mi-su-la rejoiced greatly and Yin Qing brought him to China for the traditional tributary. The emperor praised him and made him King of Man-la-ka, granted him the Imperial seal, colored-money, a complete set of clothing and the yellow regal umbrella. The Malaccan envoy replied that the “king (Parameswara) is admiring and willing to pay annual tribute, please grant the “hill” as the city of the kingdom." The emperor agreed, and granted the inscription of imperial poetry embellished onto stone tablet to the “hill” (where hill means Malacca). In 1411, Admiral Zheng He brought Parameswara, his wife, and 540 officials to China to pay homage to Emperor Yongle. Upon arriving, a grand welcoming party was held. Animals were sacrificed, Parameswara was granted a two-piece, gold-embroidered suit of clothing with dragon motifs, Kylin robe, gold and silver wares, silk lace bed quilt, and gifts for all officials and followers. Upon returning home, Parameswara was granted a jade belt, brace, saddle, and a coroneted suit for his wife. Upon reaching Heaven’s Gate (China), Parameswara was again granted "a jade belt, brace, saddle, a hundred gold & platinum ingots; 400,000 banknotes; 2600 cash; 300 pieces of silk brocade voile; 1000 pieces of silk; 2 pieces of whole gold plait; 2 pieces of knee-length gown with gold threads woven through sleeves…." Tributes that Malacca paid to Ming included: Agate, carnelian, pearl, hawksbill, coral, crane peak, golden female crane peak, suit, white cloth, Western fabric, Sa-ha-la, rhino horn, ivory, black bear, black ape, white muntjac, turkey, parrot, pian-nao, rosebush dew, su-he oil, gardenia flower, wu-ye-ni, aromatic wood, incense sticks, gold, and silver. The arrival of Zheng He (Hajji Mahmud) and his marriage with a princess of Pasai led to an economic success unprecedented in the history of the Malay people. Melaka grew into an international trading port, heralding the golden age of Nusantara Islam. Speakers of eighty languages were reportedly found in Malacca: Moors of Cairo, Mecca, Aden, Abyssinians, men of Kilwa, Malindi, Ormuz, Parsees, Rumes, Turks, Turkomans, Christian Armenians, Gujarati, men of Chaul, Dabhol, Goa, of the kingdom of Deccan, Malabars and Klings, merchants from Orissa, Ceylon, Bengal, Arakan, Pegu, Siamese, men of Kedah, Malays, men of Pahang, Patani, Cambodia, Champa, Cochin China, Chinese, Lequeos, men of Brunei, Lucoes, men of Tamjompura, Laue, Banka, Linga, Moluccas, Banda, Bima, Timor, Madura, Java, Sunda, Palembang, Jambi, Tongkal, Indragiri, Kappatta, Minangkabau, Siak, Arqua, Aru, Bata, country of the Tomjano, Pase, Pedir, and Maldives. In 1414, Parameswara passed away at the age of seventy. It is generally believed that he was buried on top of a hill at Tanjung Tuan (also known as Cape Rachado), near Port Dickson. A symbolic grave exists near Fort Canning in Singapore. Parameswara was succeeded by his son, Megat Iskandar Shah, who in turn ruled Malacca until 1424. Parameswara's Sultanate of Malacca, as a prosperous international port, changed the entire Malay Archipelago. Its success was admired by kings from neighboring kingdoms. Melaka's dominance in the region also influenced the spread of Islam in the Malay Archipelago. In 1447, Kertawijaya became King of Majapahit and converted to Islam on the advice of his wife, Darawati, a princess of Champa. The nephew of Kertawijaya, Sunan Ampel, spread Islam around Surabaya, and around the same time, Palembang converted to Islam. In 1459, Sultan Mansur Shah of Malacca sent Tun Perak to conquer Kedah and Pahang. Pahang became an Islamic sultanate under Malacca. In 1470, Dai-Viet captured Vijaya, the capital of Champa, killing 60,000 Cham, and caused a mass Cham emigration to Malacca and Cambodia. The Islamic Kingdom of Demak was founded in 1478, by Raden Patah, son of King Kertawijaya and his Champa wife. An Islamic Sultanate was founded at Cirebon too. Malacca had a well-defined government with a set of laws. On top of the sultanate's hierarchy, the sultan was an absolute monarch. Below him was a bendahara, a position similar to that of a prime minister. The bendahara, who served as an adviser to the sultan, was a commoner appointed by the sultan and was the highest ranking office that could be held by commoners. Under a bendahara, a laksamana's authority was paramount. A laksamana was an admiral who commanded the army and and was responsible for the state and the sultan's security. Below him was the temenggung—something like a chief of police. At the bottom of this hierarchy was the penghulu bendahari, who was the treasurer of the state, and the shahbandars who were responsible for matters of trade and ports. The fifth and most famous Malaccan bendahara was Tun Perak (d. 1498), the son of Malacca's first bendahara, Sri Wak Raja Tun Perpatih Besar. He served under four sultans (Sultan Muzzafar Shah, Sultan Mansur Shah, Sultan Alauddin Riayat Shah, and Sultan Mahmud Shah) from 1456 to 1498. Early in his life, Perak was a soldier-statesman for Malaccan rulers. 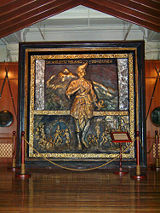 In 1445, he led the Malaccan army to victory by defeating Siamese invaders. As a result, he was made bendahara in 1456, and stopped another Siamese invasion the same year. Tun Perak was instrumental in colonizing Pahang, Terengganu, Johor, Riau, Lingga, Bengkalis, Karimon, Rokan, Siak, Kampar, Jambi, Inderagiri, and Aru, whose leaders all converted to Islam. Due to Malaccan influence. Tun Perak was very loyal towards the Malaccan Sultanate. When Sultan Mahmud Shah's son Raja Muhammad killed Tun Perak’s son, Tun Besar, due to a misunderstanding, did not seek revenge against the sultan. Instead, he requested that Raja Muhammad be crowned elsewhere. The sultan honored Tun Perak's request, and made Raja Muhammad a sultan in Pahang. Hang Tuah was a legendary Malaccan laksamana whose story is told in the Malay literary works, Hikaya Hang Tuah and Sejarah Melayu (Malay Annals). He was famous for his unfaltering loyalty to the sultan, and won many battles together with his four brave friends. The sultanate was governed with several sets of laws. The formal legal text of traditional Melaka consisted of the Undang-Undang Melaka (Laws of Malacca), variously called the Hukum Kanun Melaka and Risalat Hukum Kanun, and the Undang-Undang Laut Melaka (the Maritime Laws of Malacca). The laws as written in the legal digests went through an evolutionary process and were shaped by three main influences, the early non-indigenous Hindu and Buddhist tradition, Islam, and the indigenous adat. A bronze sculpture of Hang Tuah, a legendary Malay hero. Exhibited at the National History Museum, Kuala Lumpur, Malaysia. The Sultanate thrived on entrepôt trade and became the most important port in Southeast Asia during the fifteenth and the early sixteenth centuries. In the spice trade, Malacca served as a gateway between the Spice Islands and high-paying Eurasian markets. This is reflected by the Portuguese writer, Duarte Barbosa, who wrote, "He who is lord of Malacca has his hand on the throat of Venice." One of the factors that contributed to the rise of Malacca were the monsoon winds that enabled Arab and Indian traders from the west to travel to China in the east and vice versa. At the height of its power, the Sultanate encompassed most of modern day Peninsular Malaysia, the site of modern day Singapore and a great portion of eastern Sumatra. It was also the center of Islam in the eastern sphere, where imams and ustazes came to discuss religion and philosophy. Most of South East Asia at that time was Hindu, and Muslim missionaries were sent by the Sultan to spread Islam to other communities in the Malay Archipelago, such as in Java, Borneo, and the Philippines. The Sultanate's most important regional rivals were Siam in the north and the declining Majapahit Empire in the south. Majapahit was not able to control or effectively compete with Malacca within the archipelago, and came to an end during the later fifteenth century. Siam attacked Malacca three times, but all attacks were repelled. Hearing of Malacca's great wealth from Asian traders, the Portuguese king sent Admiral Lopes de Sequeira to find Malacca, to make a friendly compact with its ruler and to stay on as Portugal's representative east of India. The first European to reach Malacca and Southeast Asia, Sequeira arrived in Malacca in 1509. Although he was initially well-received by Sultan Mahmud Shah trouble quickly ensued. A general feeling of rivalry between Islam and Christianity had existed among a group of Goa Muslims in the sultan's court after the Portuguese captured Goa. The international Muslim trading community convinced Sultan Mahmud that the Portuguese were a grave threat. Mahmud captured several of Lopes de Sequeira’s men, killed others and attempted to attack the four Portuguese ships, which managed to escape. It became evident to the Portuguese that conquest would be the only way they could establish themselves in Malacca. In April 1511, Afonso de Albuquerque set sail from Goa to Malacca with a force of some 1200 men and seventeen or eighteen ships. The Viceroy made a number of demands, including permission to build a fortress as a Portuguese trading post near the city, all of which were refused by the Sultan. Conflict was unavoidable, and after forty days of fighting, Malacca fell to the Portuguese on August 24, 1511. Although Malacca seems to have been well supplied with artillery, the combination of Portuguese firepower, determination and fanatical courage prevailed. The Malaccan side was also hampered by a bitter dispute between Sultan Mahmud and his son Sultan Ahmad. Albuquerque remained in Malacca until November 1511, preparing its defenses against any possible Malay counterattack. Sultan Mahmud Shah was forced to flee Malacca. The sultan made several fruitless attempts to retake the capital. The Portuguese retaliated and forced the sultan to flee to Pahang. Later, the sultan sailed to Bintan and established a new capital there. With a base established, the sultan rallied the disarrayed Malay forces and organized several attacks and blockades against the Portuguese's position. The frequent raids on Malacca caused severe hardship for the Portuguese. The raids helped convince the Portuguese that the exiled sultan's forces must be silenced. A number of attempts were made to suppress the Malay forces, but it wasn't until 1526 that the Portuguese finally razed Bintan to the ground. The sultan then retreated to Kampar in Sumatra, where he died two years later. He left behind two sons, named Muzaffar Shah and Alauddin Riayat Shah II. Muzaffar Shah was invited by the people in the north of the peninsula to become their ruler, establishing the Sultanate of Perak. Mahmud's other son, Alauddin, succeeded his father and made a new capital in the south. His realm was the Sultanate of Johor, the successor of Malacca. It soon became clear that Portuguese control of Malacca did guarantee their control of the Asian trade that centered around it. The Portuguese rule of Malacca was beset with difficulties: They could not become self-supporting and remained reliant on Asian suppliers (as had their Malay predecessors); they were short of both funds and manpower; and administration was hampered by organizational confusion and command overlap, corruption, and inefficiency. Competition from other ports such as Johor made Asian traders bypass Malacca, and the city began to decline as a trading port. Rather than achieving their ambition of dominating it, the Portuguese had fundamentally disrupted the organization of the Asian trade network. Instead of establishing a central port where Asian wealth was exchanged, or a Malay state to police the Straits of Malacca and make it safe for commercial traffic, they instead caused trade to become scattered over a number of ports amongst bitter warfare in the Straits. Malacca was conquered by the Dutch in 1641. Through the Anglo-Dutch Treaty of 1824, Malacca became a colony of the United Kingdom. In 1957, Malacca joined other Malay states to form Malaya and in 1963, together with Sarawak, Sabah, and Singapore, formed Malaysia. Part of the original script of Xing Cha Sheng Lan written by translator Fei Xin. Fei Xin (Chinese: 费信) was translator for the Ming dynasty admiral, Zheng He. In his Description of the Starry Raft (1436), he included early Malacca. He noted of the people of Malacca, the Malays, that "their skin resembled black lacquer, but there were some white-skinned people among them who are of ethnic Tang origin. Men and women appeared in a mallet-like chignon hair style, lived a simple and kind lifestyle, and fish in rivers and in the sea. The coastal village was inhabited by very few people and was not ruled by any neighboring kingdoms. The only produce of Malacca was tin, from a river. Tin ores obtained from river were fired into tin blocks (known as tin ingots), each weighing 1.4 jin. Malacca paid forty gold ingots annually to Siam as tax…." Tin ingots were a trading currency unique to Malacca. Cast in the shape of a peck, each block weighed just over one pound. Ten blocks made up one unit called a "small bundle," and forty blocks made up one "large bundle." ↑ Sabri Zain, Parameswara, A History of the Malay Peninsula. Retrieved August 2, 2007. ↑ M.C. Ricklefs, A History of Modern Indonesia Since c.1300, 2nd edition (London: MacMillan, 1991, ISBN 0333576896). ↑ Louise Levathes, When China Ruled the Seas: The Treasure Fleet of the Dragon Throne, 1405-1433 (Oxford Paperbacks, 1997, ISBN 0195112075). bin Adil, Haji Buyong. The History of Malacca During the Period of the Malay Sultanate. Kuala Lumpur: Dewan Bahasa Dan Pustaka, 1974.
bin Mohd Basri, Ahmad Fauzi, Mohd Fo'ad bin Sakdan, and Azami bin Man. Sejarah Tingkatan 1. Kuala Lumpur: DBP, 2004. Levathes, Louise. When China Ruled the Seas: The Treasure Fleet of the Dragon Throne, 1405-1433. Oxford Paperbacks, 1997. ISBN 0195112075. Liu, Yusuf Baojun. Admiral Zheng He (1371-1434), the Great Muslim Envoy of China. Melaka, Malaysia: Malaysia Institute of Historical and Patriotisme Studies, 2004. ISBN 9834182805. Omar, Asmah Haji. The Encyclopedia of Malaysia. Singapore: Archipelago Press, 2001. ISBN 9813018526. Ricklefs, M.C. A History of Modern Indonesia Since c.1300, 2nd edition. London: MacMillan, 1991 ISBN 0333576896. Yun-Tsiao, Hsu. Notes on the Relations Between Ryukyu islands and Malacca Sultanate During 1464-1511. Singapore: The Southeast Asian Research Centre, 1968. Yusoff, Iskandar, and D.J.M. Tate. The Malay Sultanate of Malacca: A Study of Various Aspects of Malacca in the 15th and 16th Centuries in Malaysian History. Kuala Lumpur: Dewan Bahasa dan Pustaka, Ministry of Education Malaysia, 1992. ISBN 9836228411. This page was last modified on 8 August 2018, at 16:11.